The Greek guitarist Antigoni Goni enjoys a truly international career, having performed extensively in Europe, Russia, North and South America and the far East, both as a recitalist and soloist. Antigoni Goni’s career blossomed in the mid ‘90s when she added to her long list of competition prizes the first prize of the Guitar Foundation of America Competition, becoming thus the first and only Greek to ever win it. Her victory resulted in some 65 concerts in North America and a contract with Naxos Records, for whom she has recorded three highly successful CDs. Antigoni Goni regularly performs in concert halls such as the Concertgebouw in Amsterdam, the Covent Garden and the Wigmore Hall in London, Gasteig Hall in Munich, the Athens Megaron and the Odeon of Herodes Atticus in Acropolis (Athens) as well as the Philharmonic and the Cappella Sale in St. Petersburg and the Bolshoi Theater in Moscow. Across the Atlantic her US engagements bring Ms. Goni every year to concert halls such as the Weill Recital Hall in Carnegie Hall, Alice Tully Hall and the Juilliard Theater in New York City, Spivey Hall in Atlanta, Benaroya Hall in Seattle and Herbst Theatre in San Francisco. Having studied with great masters such as Evangelos Assimakopoulos, John Mills, Julian Bream, Sharon Isbin and Oscar Ghiglia, she brings her internationally acclaimed expertise to universities and music academies around the world through regular seminars and master classes and she is regularly invited to judge the most prestigious international guitar competitions in Europe and the United States. A NAXOS and KOCH recording artist, her highly successful recordings have been praised for being "expressively poetic and technically exciting" and have been received with great enthusiasm by the international musical community. At least a dozen of the pieces she has recorded, have been included in Enrique Robichaud’s classical guitar Cd guide: Guitar’s TOP 100 Best. Composers such as Augusta Read Thomas, Sergio Assad, Stanley Silverman, Ernesto Cordero, Tulio Peramo, Calliope Tsoupaki, John Magnussen, Atanas Ourkouzounov, and Dusan Bogdanovic have composed and dedicated works to her. Since 2005 Antigoni Goni is Professor of Guitar at the Royal Conservatory in Brussels (Koninklijk Conservatorium Brussel) and a member of its Artistic Committee. She was the founder and chair of the Guitar Department at the Juilliard Pre-College Division (where she also taught for 10 years), an adjunct professor at the Columbia University as well as Artist –in-Residence with San Francisco Performances where for 5 years she gave semi-annual performances, master classes and workshops for a diverse group of students and audiences. For her International achievements, the Royal Academy of Music in London awarded her with the honorary position of Associate Professor (ARAM). In 2007 she founded the Volterra Project, Summer Guitar Institute (of which she is Artistic Director), an innovative Classical Guitar workshop that every summer brings together in Italy, international students and professionals of the highest caliber for 10 days of intense study and inspired performances in the Tuscan territory. 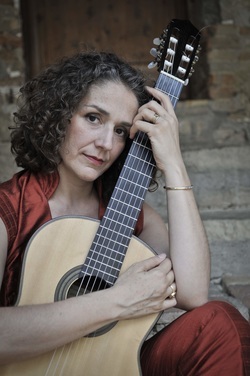 As a performing artist who has lived and worked in both the U.S. and in Europe, the Volterra Project’s Founder and Artistic Director, Antigoni Goni, has a long and in-depht experience with both the cultural differences between these societies, and with the universal climate of competition that exists in traditional guitar training programs. She enjoys a truly international career, performing extensively in Europe, Russian, North and South America and the Far East, both as a recitalist and soloist. In the 2016, the British record label Timespan recordings released her new solo album: Hymn to the Muse, a recording of works inspired by the Greek culture and heritage, composed and dedicated to her.